After three years in this trendy studio loft space, a German/French couple refreshed their decor to optimize their space and ensure it reflected their story, their respective country’s styles and the trendy Brooklyn spirit. When we started working with the couple, it became apparent that they liked 'wired' and aerial elements (like the artwork on top of the dining table, the texture of the coffee table or the candle holders). It reminded us a lot of the work of the American sculptor Alexander Calder so the concept was built around it to give the interior this airy and playful feel, in line with the artist's aesthetic. Mixing both cultures, the decor combines the clean, minimalist lines of Scandinavian design with pops of warm, Mediterranean colors and industrial lighting fixtures that highlight the high ceilings of this converted factory space. In an open plan, each space and its function needed to be defined, which was the first priority when we started this project. We used rugs, low-rise bookshelves and dividers (to maintain maximum light) to create functional areas that felt organic to the raw space. Scandinavian minimalism and sleek lines weren't just an aesthetic choice for this client. They also kept the open space clutter-free and maintained the airy feel of those high ceilings. A high ceiling and stark lines can feel cold to some people. To counter this, we added warm tones: reds, oranges and yellows from the kitchen backsplash to the bedroom. Originally from France, the tenant of this studio apartment in the East Village lived in Hong Kong and Singapore before finding his way to New York three years ago. Always on the go, he wanted his interior to reflect his European roots as well as his time in Asia and numerous trips around the world, all while remaining a soothing, welcoming place he could call home. The building in which this cozy study apartment is located in the East Village happens to be located on a “pearl sitting” spot, an auspicious configuration from a Feng Shui perspective. While taking care not to disrupt the advantageous spacial configurations (i.e, "lucky directions"), the tenant made a few adjustments to make the apartment more inviting to guests and to help him feel more grounded. Most Feng Shui consultations start with this recommendation: Clear clutter and find adequate storage units to house only those belongings considered precious enough to keep. The main occupant of the space has lived in Asia for an extended period of time and took up meditation a few years ago. By carefully selecting and arranging certain accessories, we created a space conducive to feeling focused and relaxed. Usually, a studio is occupied by one person, whose identity infuses every single square inch. But here, the tenant made a point of creating a sanctuary that eschewed a sense of individualism and felt welcoming to all who entered. 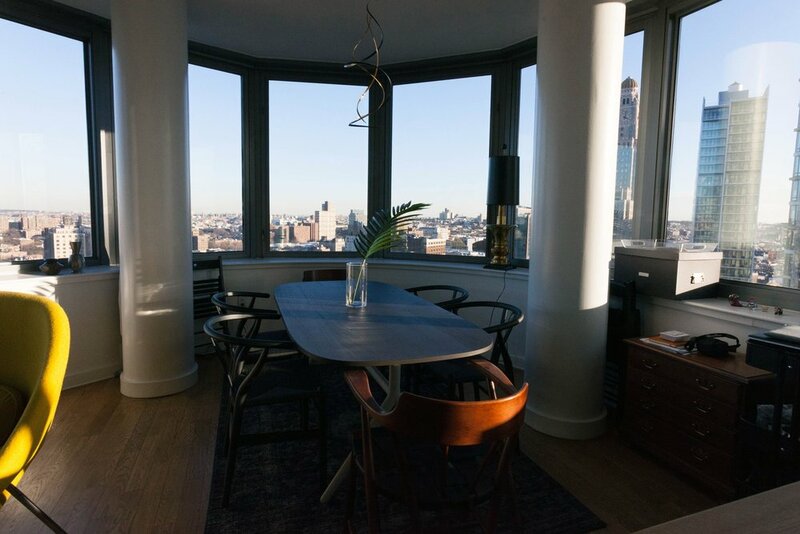 Relocating back to New York after three years in Zurich, Switzerland, this expecting couple needed to buy most of their furniture while tying in with family heirlooms in their bright, beautiful and modern Brooklyn apartment. When we started working with the couple, it became apparent that they liked 'wired' and aerial elements (like the artwork on top of the dining table, the texture of the coffee table or the candle holders). It reminded us a lot of the work of the American sculptor Alexander Calder so the concept was built around it to give the interior this airy and playful feel, in line with the artist's aesthetic. In an open plan, each space and its function needed to be defined, which was the first priority when we started this project. We used rugs to create functional areas that felt organic to the raw space. The floor plan of the space was not a conventional rectangle so we suggested rounded shapes, a cowhide and other unusual geometric shapes to create a cohesive and playful look. The couple had collected various pieces during their travels and recently inherited artworks they wanted to display. We suggested various arrangements for a nice and timeless gallery wall. Whether you just need to spruce up your space or are looking to completely transform your home or office, no project is too big or too small! Our e-design service offers a flat rate per room, that makes it easy for you to add rooms and enables us to work with you, wherever you are! We'll help you with every part of your design from the flooring, to the draperies, to the accessories that go on your table. We can help with any interior design project that does not require construction! The entire design process, from start to finish, is completed online on a special e-design platform (powered by Laurel & Wolf). You can review our full portfolio here and click on the 'DESIGN WITH ME' button. From there, you will be prompted to give details about your project and we will receive a notification to begin the work (sharing concept boards with design options). You will be able to provide us feedback 24/7 via the platform on every board we submit for your project and we will have 10 days to refine your design until delivery of your final package (that includes room rendering, floor plan, staging recommendations and shopping list). Laurel & Wolf also provides a shopping service to make your ordering process even easier! Prior to changing tenants, this top-floor railroad apartment in a typical brownstone in Bedford Stuyvesant, Brooklyn, got a facelift. The future tenant was able to offer her preferences for finishes—which were white all the way—and asked for a color consultation to make sure her “vanilla” choices were not too dull. The client asked to have the apartment painted white with a light finish on the hardwood floors to brighten everything up. But once the work was complete, she realized that the once bright space ended up looking washed out and dull. During a short three-hour consultation, we defined a color scheme for each room and how it could be implemented with furniture, accessories and touches of paint to create a more vibrant mood.